The battle is mine, says the LORD. I will fight for you. Your enemies are My enemies and they cannot overpower Me! I will war against the enemy that wars against you, for he is no match for me, so he is no match for you. 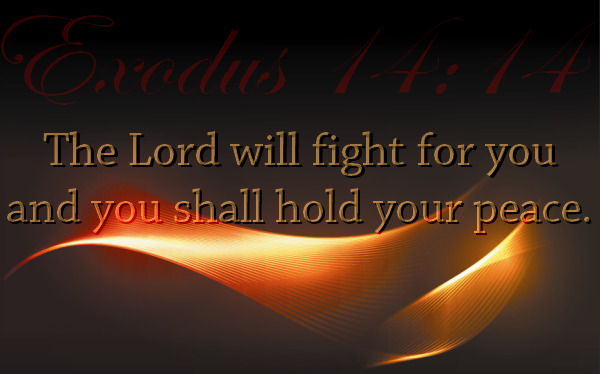 It is not a fight against flesh and blood, says the LORD. It is not people, places and things, but principalities and powers of darkness. The dark one and his cohorts are the defeated foe. I will shut the lion’s mouth that has lied against you. I will silence the scoffers and the mockers, and cause them to put their hands upon their mouths. The enemy shall not prevail against you, for I call him defeated, says the LORD. No weapon of the enemy that is poised against you will touch you as you raise the shield of faith that I have given you. You are undefeatable in ME, says the LORD. Do not despair, for I have never lost a battle or the war. I Am on your side and will defend you. I will save you. I will deliver you and I will sustain you. Do not fear, for I have you, and I will secure you in My pavilion where the enemy cannot touch you. Trust that I Am that place of safety for you at all times, and I will fight for you, and be your ever present help in times of trouble, even trouble that is on every side. You are safe and secure in Me at all times and nothing can conquer you, for nothing can conquer me, says the LORD.